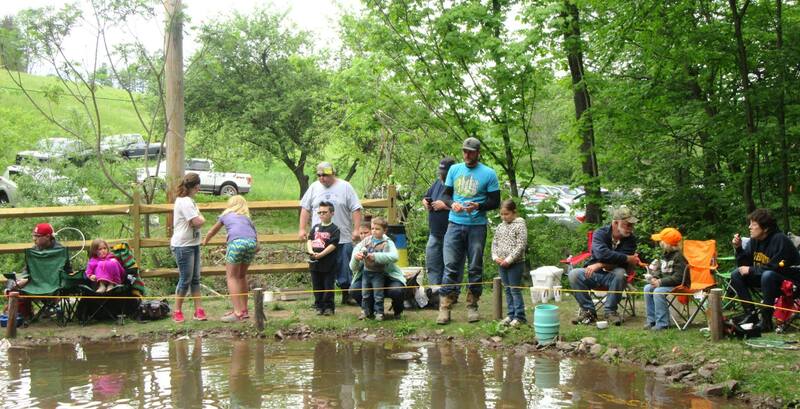 Children one year of age through 12 got in the first round of fishing on May 20 as the North Branch Kids Trout Derby chalked up another successful year in Lovelton. 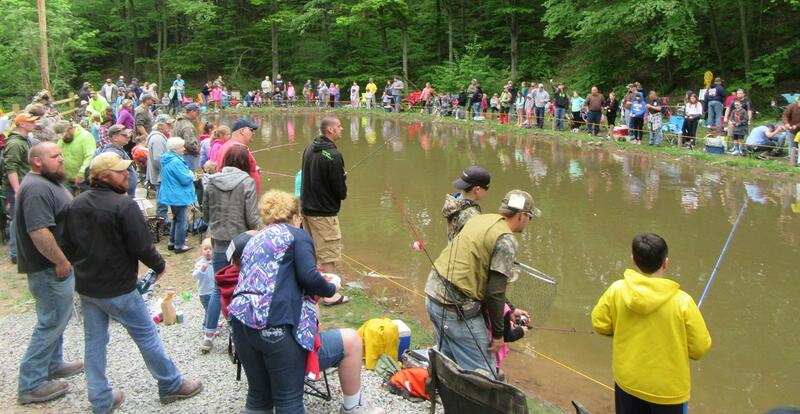 Teens fished in the afternoon, and children with special needs had the pond to themselves on May 21. 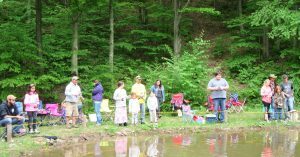 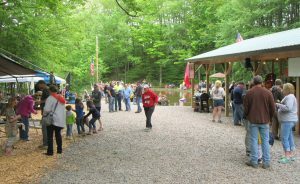 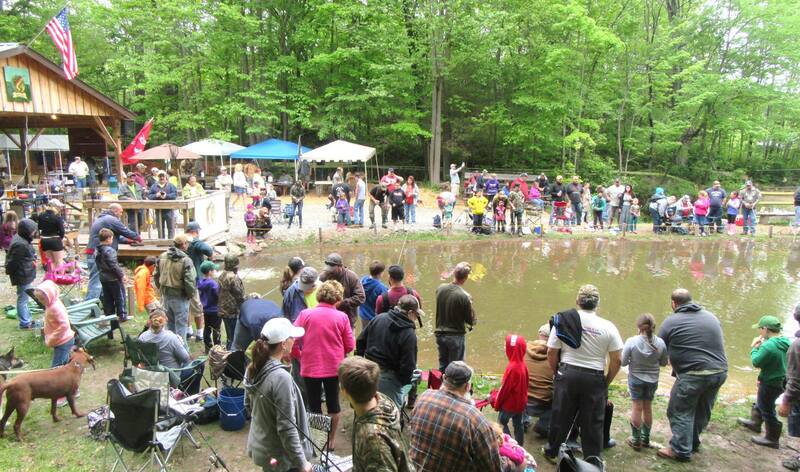 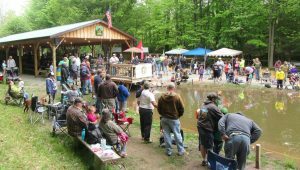 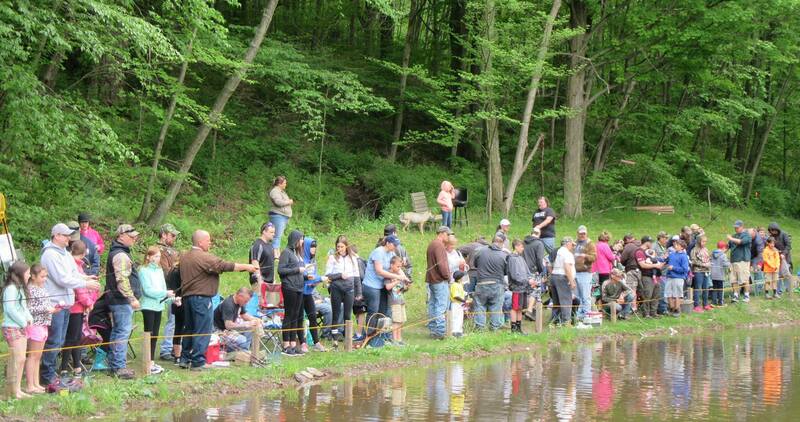 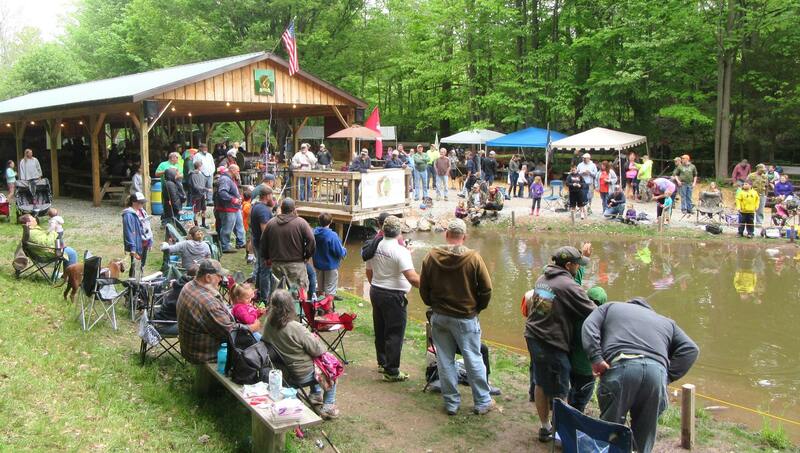 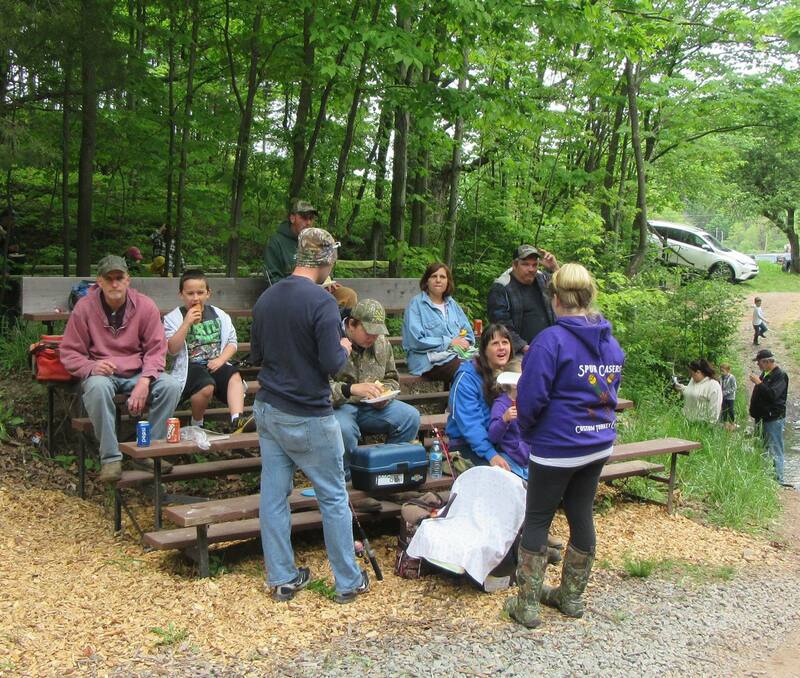 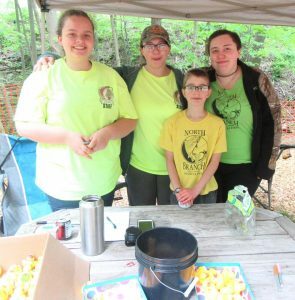 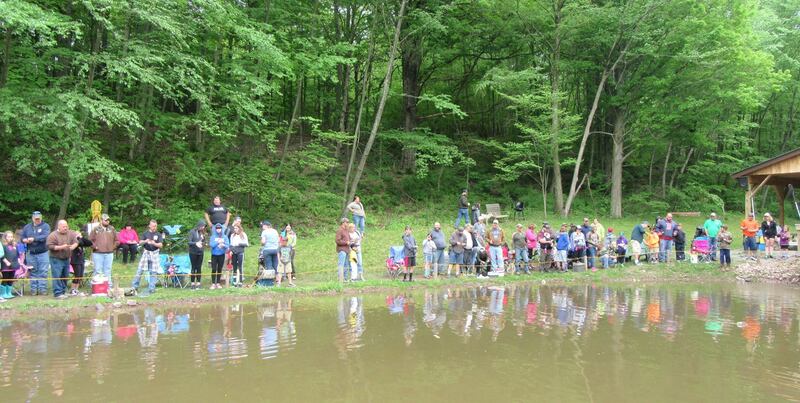 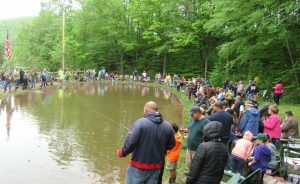 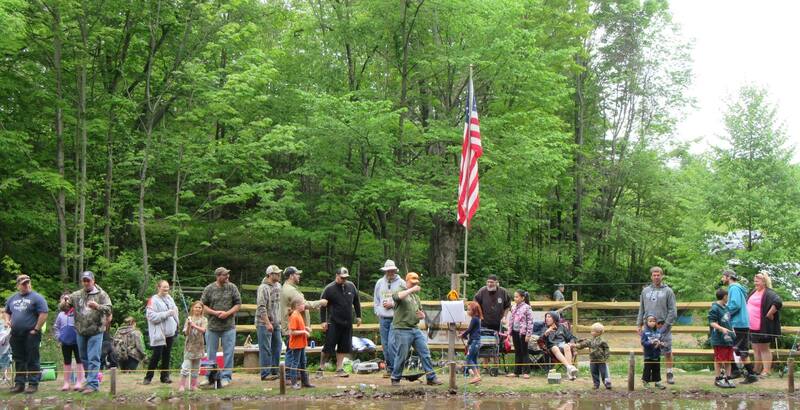 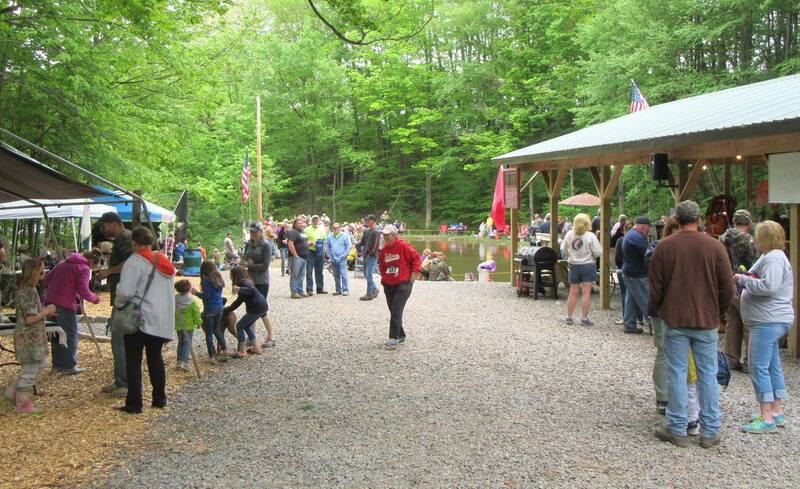 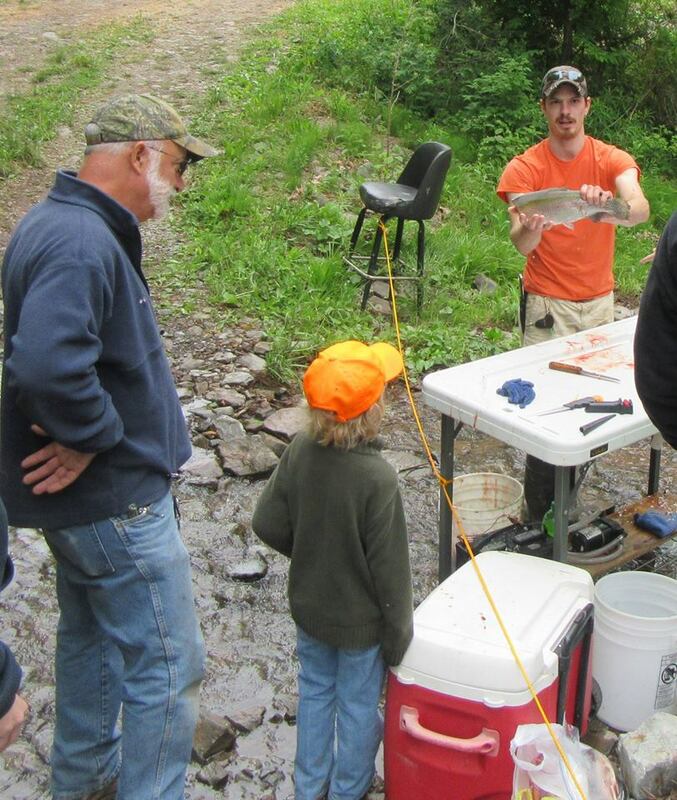 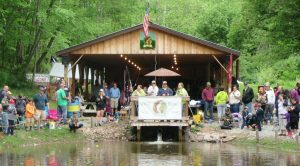 Hundreds of youths and their extended families converged on a relatively tiny pond on the outskirts of Lovelton in Wyoming County last Saturday to participate in the annual North Branch Kids Trout Derby. 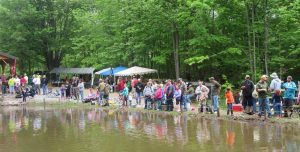 Organizers said that attendance was down a little bit due to the threat of rain, but anybody visiting for the first time would be hard pressed to imagine that more people could fit into what has become a truly magical place for so many. Harry Shaw (above, left) of Bucks County and Bruce Pitts (right) from the Back Mountain are the key organizers and officers of the North Branch Trout Derby Association, simultaneously manning a sturdy dock that juts out over one end of the pond from a large pavilion. 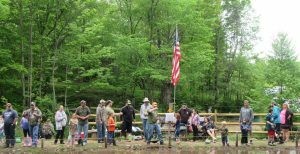 When strains of country and bluegrass music are not filling the air, the men are making announcements and conducting pop-up contests within the ongoing competition. Shaw and Pitts credit Clesson Shotwell and Chuck Richter for starting the fishing derby, which ran from 1980 to about 1995. 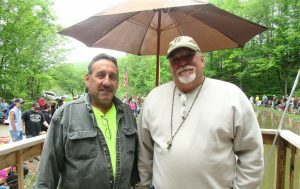 They’re grateful as well to landowners Timmy and Bev Poole for allowing them to resurrect the popular event for a new generation. 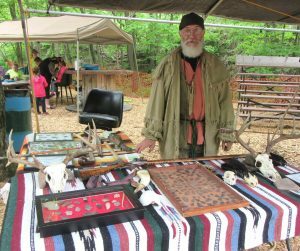 The property has been in the Poole’s extended family for at least 60 years, according to their son, Chris. 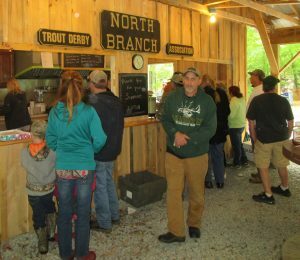 “Grow” seems to be an understatement as Pitts and Shaw point to the large pavilion built three years ago and a very busy food stand added just last year. 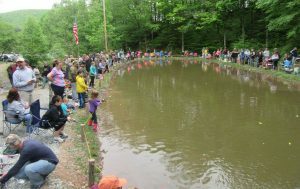 The pond was expanded, and a new platform constructed. Prizes for the youths and for anyone who purchases Chinese auction tickets are donated by individuals and businesses far and wide. 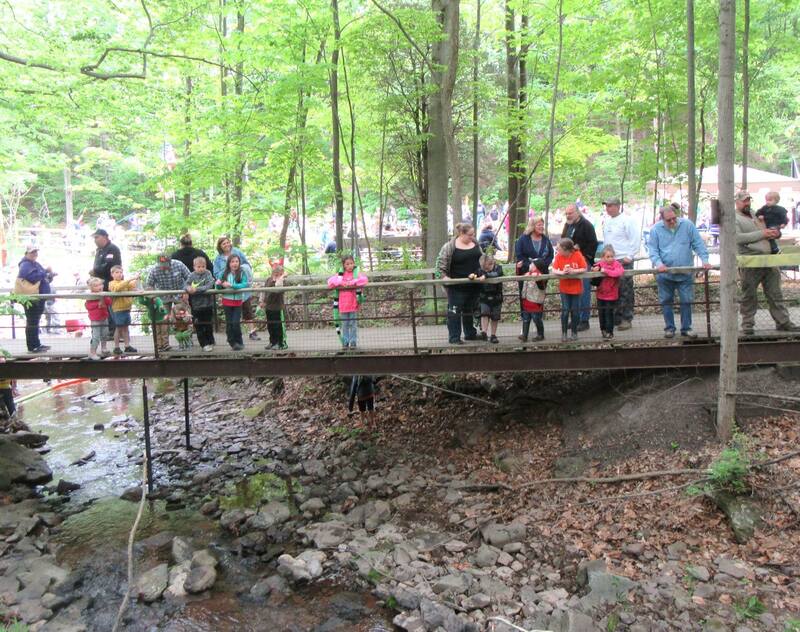 The foot bridge over adjacent Elwood Creek that leads to the site doesn’t look more than 10 years old. 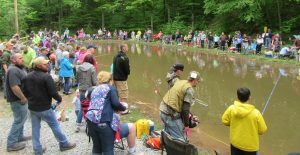 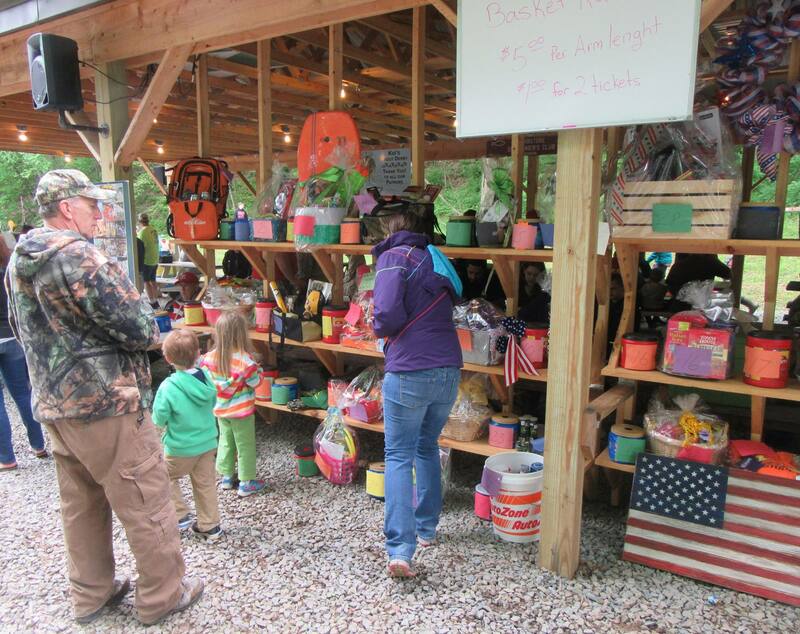 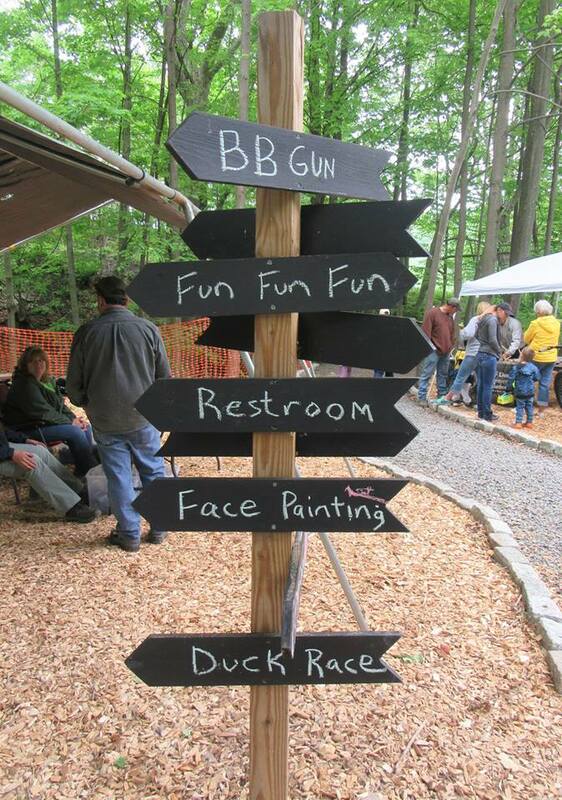 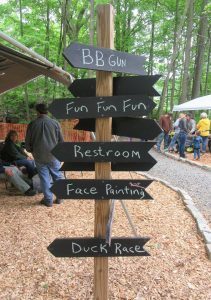 The measured expansion includes the involvement of exhibitors, a bouncy house, a duck derby, a separate fishing adventure for youths with special needs on Sunday, and plans for a junior pheasant hunt on Oct. 14. For more information, interested readers may follow the North Branch Trout Derby Association on Facebook. 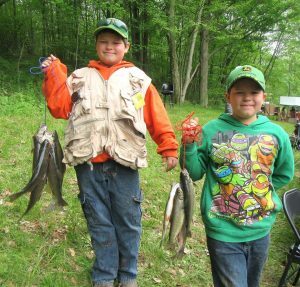 Twins Izaak (above, left) and Izayah Fornier of Mehoopany had stringers of fish to take home with them on May 20. 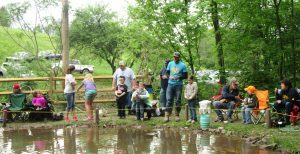 Kacie Fisk (above, left) of Dupont won a Visa gift card for reeling in one of the few catfish in the pond during the Kids Trout Derby. 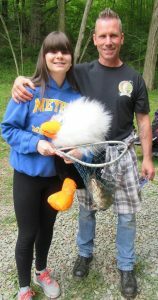 She was fishing with her father, Chris. Assisting with the Duck Derby were (above, from left) Mariah Tague, Grace Richter, Harrison Fenton, and Crystalynn Richter. 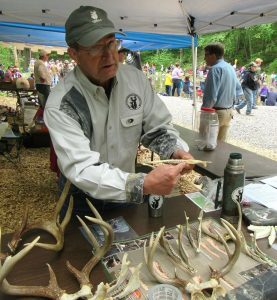 Chip Sorber (above) of the Quality Deer Management Association explains how to judge the approximate age of a deer by its teeth. 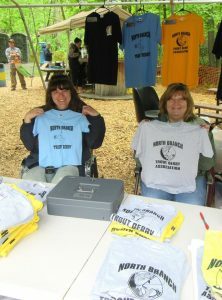 Kris Wiggans (above, left) and Barb Honeywell, bith of Sugar Run, were selling T-shirts to support the Kids Trout Derby. 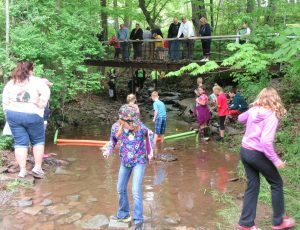 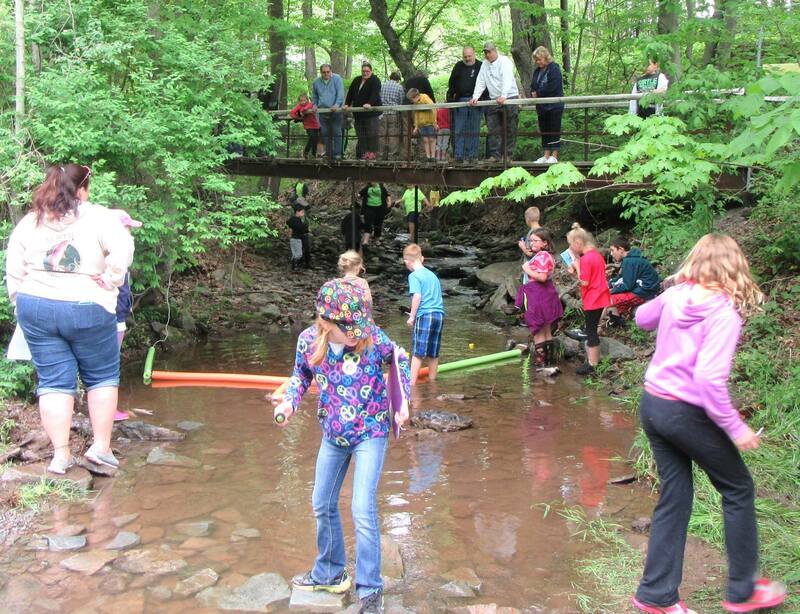 Families line the bridge over Elwood Creek to watch for their ducks to float down stream during one of many duck derbies conducted on May 20. 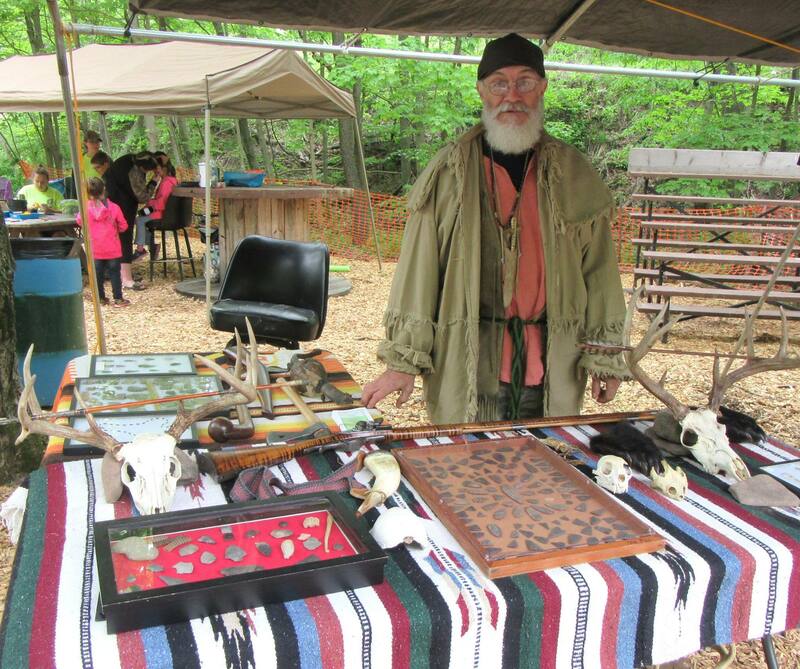 Robin Robinson (above), president of the Endless Mountains Primitive Outdoorsmen, displays a variety of animal skulls and Native American artifacts. 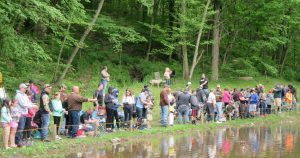 Crowd Shots! Can you find yourself and your friends in these photos?